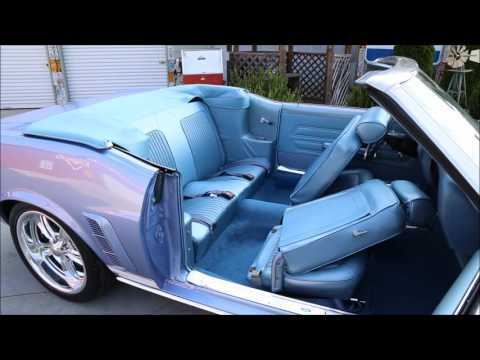 Up for sale we have a 1969 Ford Mustang Convertible. It has good lines with good fit of the doors, hood and trunk. The panels are straight as an arrow. At the time of the resto they installed new bumpers and handles. All the chrome around the windshield and around the top looks good, but is not new. The body is covered in the Winter Blue Paint that is accented by the White Hood Stripe and New White Convertible top. The paint is very good with a slick finish and a deep rich shine. To finish off the exterior it is sitting on a set of factory chrome steel wheels with caps and rings and set of BFGoodrich White Letter tires. On the inside it's all done in blue. It has the correct bucket seats. This is a non-console car with the correct Automatic floor shifter. The top is power with new cylinders and it has a blue top boot for when the it's down. You'll see it has an AM/FM 8 track player as well as the correct steering wheel, and it also retains the seat belts. Under the hood it's powered by a 302 V8 that looks stock right down to the factory air cleaner. It's mated to a C4 Automatic Trans and an 8” Rear End. This Mustang comes with Power Steering and Power Brakes. When you look under it you'll see the stock manifolds and single exhaust. The frame rails look good and it has had new floor pans installed at some point with a good job being done.